Kiku and David are absolutely thrilled to not only have the honor of performing for Music For Autism, but the opportunity to share in the goal of a safe space for families to enjoy the gift of music. Music is a worldwide language, and knows no boundaries. Gifts are meant for giving, receiving and sharing, and having the opportunities to share again and again with our community is one of the greatest joys for them both. Trombonist David Gibson has enjoyed a varied musical career which is deeply rooted in the genres of jazz and funk.Jazz luminary Curtis Fuller said about Gibson, “Out of all the young players I hear in the music today, David is one of very few who speaks the language of jazz”. Gibson’s early experience in New York had him performing with Slide Hampton, Jon Faddis, Roy Hargrove, Jimmy Heath, James Moody and others. In 2003, he was a finalist in the Thelonius Monk International Trombone Competition and has subsequently released seven recordings, as a leader. His current quintet has been cutting its teeth in the jazz clubs of NYC, such as Smalls, Fat Cat and Dizzy’s Club, at J@LC. Though Gibson’s compositions make up the bulk of their music, this eclectic group’s repertoire also runs the gamut with arrangements of material from Dr. Billy Taylor to George Harrison. 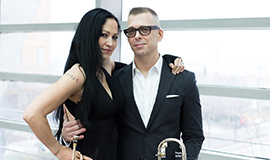 David is busy performing with and composing for many diverse artists in New York City, including Roy Hargrove, Orrin Evans, and George Gee, in addition to teaching at the New School University and Columbia University. Legendary trombonist/composer Slide Hampton says, “David Gibson is one of the very talented, truly dedicated musicians on the New York scene today.” David enjoys every opportunity to perform for live audiences and counts the M4A audience as his favorite group with which to connect. M4A concerts clearly demonstrate the power that music has to inspire deep and lasting connections between people. With two recordings as a leader, to her credit, and another on the way, Kiku maintains a very busy lifestyle, personally and professionally. Music For Autism has played a huge role in her life as a performer and human being, and is always thankful to be able to perform for such a beautiful community. While she has enjoyed very high profile jobs, M4A has proven to be one of the most rewarding.